In response to monkeypop, the numbers posted on Motor trend are factory, yes dechipped it can reach 171mph. Please correct 0-60 times 4.9 quarter 12.9-13.3 depending on driver (not burning out) and mileage, tire choice. \"dechipped\" does not count on FL. The car tested in that link was modified thus the results do not reflect what the stock factory car can do. 2000 motor trend, 0-60 4.8 top speed 171 dechipped. Please correct numbers. 0-100 is 5.4sec and 5.7sec for the estate. 0-200 is just over 20sec. Mass data is wrong. 1710kg not 1610kg. According to carfolio.com curb weight (leergewicht) is 1710 kg. It can't be 1610 kg. This is a 4.8 meters long Mercedes with a 5.4L V8 and full of luxury, so it can't be 1610 kg. 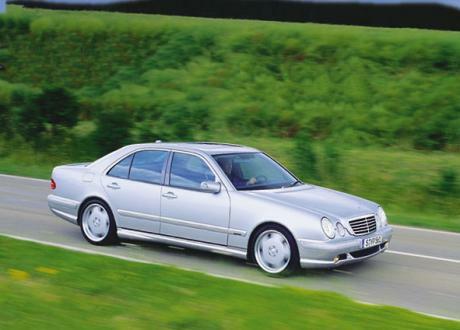 According to the 1997 German car catalog E420 with a 4.2L V8 is 1690 kg, and I'm sure, that E55 AMG is heavier than E420. Official AMG figure is 1710 kg. I don't think that 11.9 1/4 time is from the 1999 E55.... the car in the link is a 2005 model. 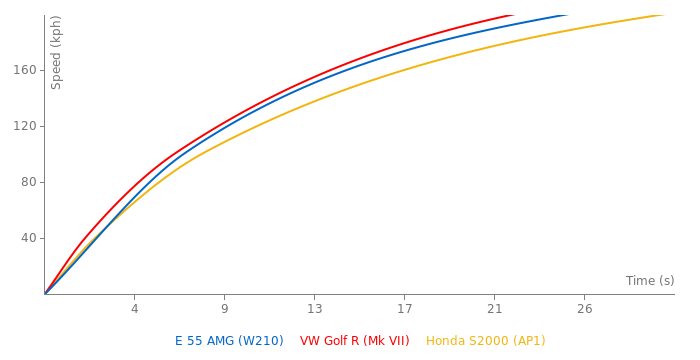 0-100 km/h: 5.4 s (AMG figure). I don't think the mass data is correct (AMG figure is 1710 kg).